Mullvad VPN Review: Is It Worth Your Time And Money? 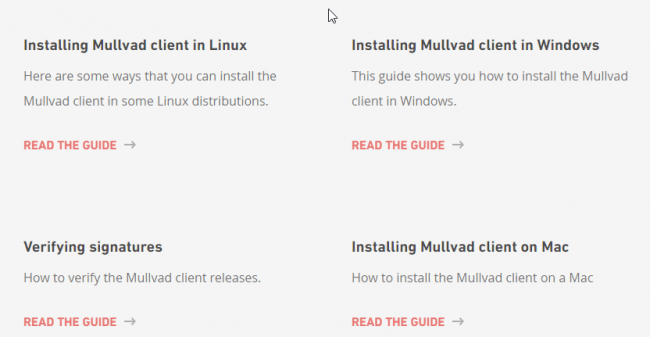 Mullvad Review: Is It Worth Your Time And Money? Should you go with Mullvad VPN? Read on to find out. Mullvad VPN service is based in the not-so-well-known city of Gothenburg. You probably don’t know where Gothenburg is (outside of the Batman universe that is), so we’ll tell you it is in Sweden. Mullvad VPN service is basically owned and operated by a company that goes by the name of Amagicom AB Company. As per official documents, Mullvad wants to make the internet a better place for everybody. What does the company exactly mean by “better”? Well, they have an answer for that as well. Mullvad plans to do that by knocking down infrastructure the helps governments and companies censor content. They also want to make surveillance on part of any entity, ineffective. And since it is a VPN service, it is also committed to bringing its customers unmatched online privacy. The company achieves that goal by protection the location and the identity of all its customers. In other words, it keeps them private. As mentioned earlier, Mullvad VPN service is based in Sweden. For those who are familiar with what happens to VPN services in places like EU and USA, this gives Mullvad a considerable head start. Considerable head start over what you might ask? Mullvad is in a way better position than some of the other VPN services out there in the market in terms of friendly laws. More specifically, we’re talking about the European Union Data Retention Directive. That directive’s constraints did not apply to VPN service providers who worked from Sweden. And what does that do with Sweden? It makes Sweden the absolute perfect place for any VPN service to start its business. But even a VPN service provider is not located in Sweden, there is another way to benefit from the lack of oversight. VPN service providers can also just place their VPN servers in Sweden. If they do that, they come under the umbrella of Swedish law. Of course, the ideal situation would be if a VPN service also operated from the same place, but you can’t have everything in life or can you? With that, it also has to be mentioned that as far as consumers go, Sweden isn’t a bad place for them either. Since there is a lack of censorship in Sweden, this makes it a safe-haven for online users who value privacy. That was it as far as introductions go. Let’s take a look at what makes Mullvad a good VPN service. The first question we should ask is that, is it a good VPN service? Does it rank well against the likes of IPVanish, PureVPN, and NordVPN? Can it provide extra features at a reasonable cost to consumers? All of these questions will determine if Mullvad VPN is worth your money and time. One of the first features you immediately notice about Mullvad when visiting the official website is the free trial one. We also want to say something about the money-back guarantee feature but we’ll come to that a bit later in the review. Let’s look at the details of these two features before we move on to the rest of the features. Because if a VPN service provider doesn’t offer these two now essential features, that means something is not right. In order to win the trust of a customer a VPN service provider has to take some risks. Offering a money-back guarantee along with a free trial is part of that risk. From the content available it seems that Mullvad VPN fully understands this concept. The company realises the fact that most future VPN potential customers would want to take the service for a test drive before signing up. And there is nothing wrong with that provided a user doesn’t abuse policy through fake email addresses. Moreover, a user may want to know if a given VPN service is up to his/her standards. Not every VPN user is a first time user. Veteran users of VPN servers always look for free trials and money-back guarantee policies. Without those, it would become virtually impossible to know which VPN service is genuine and which is fake. Now, we’ve already mentioned that Mullvad seems considerate towards its customers. It turns out, they aren’t that concerned. Let’s take a look at why we say that. The Free Trial Feature Is Not Fully Fleshed Out. You might read that headline and think, what do we mean by not properly “fleshed out”. Either a VPN service has a free trial period or it doesn’t. We’re here to tell you that it isn’t the case. Free trial periods can be as different as VPN service providers themselves. For example, Mullvad VPN does offer a free trial but it only lasts for, at a max, three hours. The free trial is available anyone who wants to test out the VPN service before making the final decision. When you log in to the official website or try to install Mullvad VPN client, it gives you two options. Option one is to create a new trial account. Which allows users to avail the free trial feature. Option two enables customers to log into their existing account. As mentioned before, the free trial is short, to say the least. But we look at it from the perspective of the Mullvad VPN, three hours is more than enough time for a potential user to test out the VPN service. A free trial feature is a must for anyone who values privacy and wants assurance that the VPN service indeed protects it. You should also know that the only thing you need to do in order to avail the free trial is to sign up for a free account. Regardless of the fact if Mullvad VPN is an acceptable VPN or not, a three-hour free trial version is too short. Of course, it is enough to test out the service but in the real world, things turn up, plans go to ruin. So a user could need a day or two to fully judge the quality of the VPN service. Most known VPN service providers offer a seven day trial period. Some offer a twenty-four hour trial period which seems like a reasonable choice of time period. Anything shorter than that gives the impression that the VPN service provider is trying to hide something. Most people who want to sign up for a VPN service don’t realize this fact. You don’t want to give your true credentials to any VPN service if you really know how to protect your privacy. Most VPN service providers don’t highlight this fact. A user’s privacy can be compromised at any stage of the signup process. To Mullvad VPN’s credit, they do keep a good check on a user’s privacy. The company protects it by not requiring new users to give their name or email address to the company. You can just go to the official website and download the client for your operating system without inputting any information. You only need to complete Mullvad VPN’s CAPTCHA verification step. After the verification process, the new trial account is created automatically. Mullvad offers new users quite an impressive list of payment options. Needless to say, the list is impressive. What About That Mullvad Money-Back Guarantee? A money-back guarantee, as mentioned before, is a good sign that the VPN service has confidence in the product it is offering. It also shows that the VPN service provider is ready to refund people who aren’t satisfied with their service. Mullvad does none of that. And loses a lot of points in its final review score. In other words, it doesn’t offer any money-back guarantee. As mentioned before, this already puts a question mark over the integrity of Mullvad VPN service. A company that is supposed to offer new users total anonymity along with security, this feature is a must-have one. Mullvad VPN now offers a 30-day money-back guarantee. The company however can’t send you money if you paid in cash. Because of some apparent anti-money laundering regulations. Mullvad VPN service has a fully developed Kill Switch feature. This feature allows the user to block internet traffic whenever the VPN connection is dropped. It can be helpful for situations where VPN server disconnects unexpectedly. With a Kill Switch feature, your privacy is protected come what may. This certainly gives Mullvad VPN an edge over many other VPN service providers. The official website has a modern look and feel to it. Plus it is organised very well. Everything seems to be in the right place. Moreover, it is extremely user-friendly. You won’t be wasting any of your clicks while you’re on Mullvad VPN’s official website. The one technical aspect you need to know about the official website is that, for some reason, Mullvad VPN avoids using Google Analytics on its site. You already know that most of Mullvad VPN’s servers use OpenVPN VPN protocol by default. It combines very well with other security software like Tor. You can scour the bowels of Deep Web without having to worry about a hacker discovering your computer. Additionally, Tor is considered to be the safest way to create point-to-point connections. Mullvad VPN just adds an additional layer of protection. So you already know that OpenVPN is open source. What you should also know that it is the most secure VPN protocol. As far as bandwidth is concerned, Mullvad VPN offers all of its subscribers unlimited VPN. This feature is ideal for users who download a lot of files and stream a lot of videos. A VPN website that is not only user-friendly but also very efficient. Users who want to pay using anonymous methods can do so through cash and Bitcoin. Hence it makes it much more difficult to trace subscribers through payment records. Servers available in a wide range of regions such as Sweden, Canada, USA and the Netherlands. More choice means that users can unlock more content than ever. Kill switch allows the VPN service to disconnect all outgoing and incoming traffic upon connection drop. This ensures total privacy with or without an internet connection. In order to review any piece of software, you must actually use it and then judge. You can go to the official Mullvad website right now and download its client. Make sure it is suited to your operating system, otherwise it won’t work properly if at all. For example, users who have Windows installed on their computer machines should download the installer that is compatible with the Windows operating system. When you download the installation file for Mullvad VPN, you will be guided through the rest of the process by an installation wizard. All you need to do here is to click install and the VPN service will begin the installation process. In other words, the installation interface is pretty intuitive and self-explanatory. In short, download the executable file from the official website and then hit install. If you have a decent computer machine, the installation process should not take long. And for that, Mullvad receives extra points. The setup for any software application should be quick, easy and reliable. Some of the VPN service providers in the market don’t pay enough attention to this aspect. And hence end up with a software installation process that is both complex and requires a significant amount of technical skills. Some VPN service installers even force you to consult the customer support. They are that difficult to install. As indicated earlier, with Mullvad VPN, you only download the file and then install the file. Using the Mullvad VPN client you can connect to any server of your choice. But the client connects to a default server in any case so that new users don’t have to click too many buttons to get started. If you look at the main screen you can clearly see all the options available in the main menu window. This window displays all the basic information a user would want to see from his/her VPN client. The main menu screen doesn’t have the greatest visuals you will ever see. But it does allow you to turn on and off all the available features in a pain-free method. If you want to, you can change your account number. You can also manage your account from the menu. The main menu screen also has a block feature. It basically blocks the internet connection if the VPN connection fails for some reason. Mullvad VPN’s Windows client also has a DNS leak protection feature. There is also IPV6 tunnelling feature. All of these can be accessed and altered from a single Settings tab. If you have set up Mullvad VPN client correctly and it is connected to the internet then you should see an icon. The icon should be displayed in your Windows tray and it should indicate a successful connection with a green tick. Mullvad VPN’s overall theme seems to be of simplicity. The app is very straightforward to use. If you want to disconnect from a particular server, you can easily do that from the main menu. The Windows client also allows you to re-connect to another one from the main menu itself. Another feature which gives Mullvad the edge over competitors is the intuitiveness of its VPN app. You can actually tweak all sorts of settings from the Settings tab without requiring help from the customer support department. This saves each and every user a lot of time. And we have already mentioned the fact that the installation process is painless and quick. As you can probably guess, that list basically covers all the major operating systems. Moreover, Mullvad VPN is also compatible with lots of device types. Moreover, if your platform is not listed here then there is another option. Mullvad makes the extra effort of providing source code files. Users can make use of these source code files and run Mullvad VPN client on any platform they want to. That, of course, is a very attractive choice for many consumers. Users can also set up Mullvad VPN using DD-WRT routers. With each Mullvad account, you get an option to connect up to three simultaneous devices. To do that, all you need to do is to have the same customer ID on all of your devices. The customer ID can be changed using the Settings menu from the main VPN client software application. VPN protocol support is a bit complicated as far as Mullvad VPN is concerned. They offer OpenVPN for the Android operating system but only offer PPTP for the iOS. Mullvad VPN now also offers the OpenVPN protocol for its iOS apps. For what it’s worth, you can run Mullvad VPN on an Android device with PPTP protocol as well. Mullvad VPN, just like some of the other best VPN service providers, offers a client that is configured to work with OpenVPN. This protects all the company’s users against many types of cyber attacks. We don’t need to go into the details of how cyber attack are carried out. But it is worth pointing out that most attack vectors are carried out through DNS leaks, Teredo and IPV6. Mullvad VPN users are protected against all of these. As mentioned earlier, because it is based in Sweden, Mullvad does not conform to EU Data Retention Directives. In other words, the company does not disclose information about its users. Moreover, the company keeps no logs on its customers and their activities. So even if Mullvad wanted to hand over the requested information to law enforcement agencies, they could not. Again, that is all possible because Mullvad does not store its customer’s information. As far as the encryption technology goes, Mullvad VPN makes use of a 2048-bit RSA along with a 128-bit Blowfish OpenVPN encryption. This type of encryption is best suited to users who want to stop spying agencies from monitoring them. It also allows Mullvad to stop other companies from recording their customer data. Of course, Mullvad encryption technique is not the strongest. Mullvad VPN now offers AES 256-bit CBC and AES 256-bit GCM by default. It makes use of BF-CBC only when the user is running an older version of the OpenVPN client. But the VPN company does its best to offer the highest grade encryption for the money it charges. We’ll come to the money part a bit later in the review. Mullvad VPN also has a bonus feature which protects against DNS leakage. What that really means is that the VPN service protects your IP address and makes sure it is never revealed to anyone else. Let’s just start off by saying that if total privacy is your concern then you may want to give Mullvad VPN some serious thought. It is that committed to user privacy. As indicated earlier as well, they do not ask you for your personal information while signing up. That is a good sign of a reliable VPN service. You don’t even have to give them your email address. You already know Mullvad VPN doesn’t have to cooperate with law enforcement agencies in Sweden because of its location. Moreover, Mullvad VPN does not store detailed logs on its customers and their online activities. Some of the other VPN service providers do that but they are sure to get bankrupt soon enough. And because Mullvad itself doesn’t know what you’re doing while connected to the internet, no third party can track you. Because your IP address is hidden and there are no timestamps for user activity. We can’t stress more on the fact that Mullvad doesn’t have to obey anyone’s DMCA request. Because of that, the company’s online internet traffic is completely protected. But users still need to be on their guard when it comes to WebRTC. Sometimes, carelessness with WebRTC can reveal your true IP address. And that is never a desirable scenario. But we warned that the benefits of using WebRTC may entice you. It is because of WebRTC that you can engage in audio and video communication without the need of any browser plugins. But this can expose your IP address and hence lead to monitoring. Mullvad VPN should be given credit for showing some honesty here. The company has confirmed the issue on the official website. Should note that they might have WebRTC issues. Interestingly enough, the WebRTC leak issue is not perceptible on iOS. Without speed, even the best VPN service provider doesn’t stand a chance in this industry. VPN service providers who don’t give due consideration to speed don’t get much business. Plus, it’s never a good idea todata annoy your customer with slow downloads and streams. You can check Mullvad VPN speed for yourself by going to a speed-testing website such as speedtest.net. There you can compare your VPN speed with your internet speed when the VPN isn’t turned on. Other reviewers have mentioned that Mullvad VPN does manage to offer reasonable speed. It is especially competent when it comes to P2P file transferring. But is that how speed is measured for VPN services? There are many other factors that need to be considered before a judgment on speed can be given. First, you have to connect a VPN service’s client with the internet and then measure speed. VPN servers which are located in the European Union generally respond faster than the ones in the USA. Moreover, some computers always have to bear pack loss issues when connected to a VPN client through OpenVPN over UDP. This can significantly reduce overall speeds. The best way to measure speed, then, is to measure it by creating a tunnel which runs over TCP. To do that, you have to go Advanced tab in Settings. Then simply set protocol to TCP when in the Client section. Prices are subject to change for the obvious reasons. As of this moment in time, you can sign up for Mullvad VPN service for one month by paying five euros. As you can probably imagine, that is a very competitive price. Not many VPN service providers can afford to have dirt cheap VPN packages. Now we have already mentioned that you can pay through PayPal along with Bank Wire, cash, Bitcoin and credit card. So the obvious question arises. How do you pay for Mullvad VPN service by cash? Well, the process is as simple as it gets. All you need to do is send the cash in an envelope and address it to Mullvad VPN’s headquarters. The letter can also be sent anonymously. This will again ensure that user anonymity is maintained at all times. If you really think about it, Mullvad does everything in its power to make it easy for potential customers to become actual customers. You have so many options to pay Mullvad and on top of that, the company allows you to use cryptocurrency like Bitcoin. How do you pay through Bitcoin? To pay through Bitcoin, simply get yourself the relevant Bitcoin address and then you can use that address to sign off the required amount. You will then get the access time that corresponds to your Bitcoin address. Remember that your account is always generated through random techniques. In other words, if you’re not happy with the current payment address then you can change it by generating a new one. Mullvad gives a discount to users who pay through Bitcoin. Why? You may legitimately ask. Well, it is because when a user pays through Bitcoin, Mullvad on its end doesn’t have to pay much in the way of transfer and administration fees. You can always log in to your account and check out the price management page to see how much cash is left. The first stage of making a good impression on potential customers is the official website. That holds true for any online business and more so for a VPN service provider. We’ve already established that Mullvad VPN’s official website is very efficient. It is very well organized and is elaborate when it comes to explaining the service and the business. The official website has all the necessary sections that cover almost everything that a customer could ever want to know about the service. There is also a dedicated section on the most important questions asked by customers. Moreover, you can also contact Mullvad VPN staff through an email address. The email address is protected by PGP encryption so you don’t have to worry about your privacy while contacting them. Other reviewers have noted that Mullvad’s customer support staff is generally knowledgeable and provide relevant solutions. The response time is also good. Perhaps the only problem with Mullvad customer support is that they don’t have live chat. Live chat, available 24/7, can be very profitable because of the one on one communication setup. Should You Buy Mullvad VPN? You didn’t read the whole review or did you? If you did then congratulations. You now know everything there is to know about Mullvad VPN and can make an informed decision. If you didn’t read the whole review then don’t worry. We’ll just summarise the deal with Mullvad VPN. Mullvad VPN service is a solid VPN service. It is a small VPN company that is for sure. But it tries to make up for it in other areas. Other areas such as meticulous attention to customer privacy. The VPN client itself is very easy to handle and manage. You don’t have to give up your name neither your email address to use the VPN service. The company also does not keep any logs on its users. So even if a court order requests the company to provide information on its customers, it can’t comply. The obvious problem with Mullvad VPN is the free trial feature. In short, it is too short. Mullvad scores reasonably well on speed tests and allows P2P activity on most of its servers. If they can somehow improve their server speeds for the USA then that would be great. The Bitcoin payment support is also a great feature. And they have covered everyone with the option to pay through cash. Mullvad VPN subscription packages are priced at very affordable rates and hence should attract a lot of customers. Now we come to the real problems with Mullvad VPN. Mullvad doesn’t have many locations for its VPN servers. There should also be a live chat support for customers. We’re living in the 21st century and hence customers should have support at all times. Perhaps the reason why Mullvad VPN won’t be making to the top of VPN charts is because it doesn’t have an X factor. There is nothing spectacular about Mullvad VPN. Yes, it doesn’t have any glaring holes in its service. But it doesn’t have many superstar features either. Mullvad VPN definitely has some good tricks up its sleeve. But lack of a remarkable feature and some glaring shortcomings reduce it to a run of the mill VPN service. How To Watch The US Version Of Funimation Outside The US? 2) iOS devices use OpenVPN Connect. not PPTP. Indeed Mullvad VPN has improved the most in the past couple of years. As far as performance, reliability and privacy go, there is no better VPN service than Mullvad now. Mullvad is certainly very easy to use and understand. It is very effective based on my own centric view and seems useful to researchers who wish to remain private and low-key. I believe though that their teaming with wireguard completely compromises their service and the way it is working just now, (when you change locations wireguard seems to automatically attach itself to your address. Zohair I have researched the organsations behind wireguard and their priority is not our needs but rather to identify everyone and to make that information available though LinkedIn and other such elitist memberships. It might be an interesting research for others to see as its reverse engineering possibilities makes our VPN totally ineffective (yes?)! 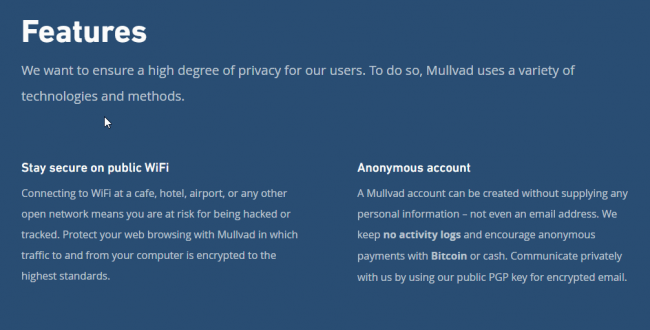 Mullvad is a reputable VPN service and plenty of review sites apart from Security Gladiators such as PCWorld and VPN mentor have rated it highly. Our research shows that for the normal user, Mullvad’s Wireguard VPN protocol isn’t something to be concerned about. Provide proof of this please. Everyone claims to be some sort of secret agent these days, saying the’ve done research or have anonymous sources, yet very few are able to back it up. Proove it with links, citations and examples, please.